October 2016 was in every sense of the words; a scorcher. The Castle Rock area received very little precipitation for most of the entire month and a strong (and stubborn) ridge of high pressure did not allow any significant storm systems to move into the state. Daily temperature records (both highs and lows) were set quite often throughout the month, especially in the final week of the month. We took a graph of each day’s average mean vs the 30 year daily average mean. You can see that while we had a few days with below average temperatures, a majority of the month was dominated by above average temperatures. Not just above average, but well above average! The last 10 days were absolute scorchers with daily high’s in the 80’s consistently setting new records across Colorado’s front range. Precipitation was pretty abysmal for October this year. In a month where we usually see a little over an inch in precipitation (some of which coming from snowfall) the Castle Rock area finished at a meager 0.14 inches of moisture. Most of that fell in the earlier part of the month, the second half of the month saw very little precipitation at all. No snowfall was recorded in October 2016. This the third consecutive October with no snowfall; the first time this has happened in Colorado weather history. 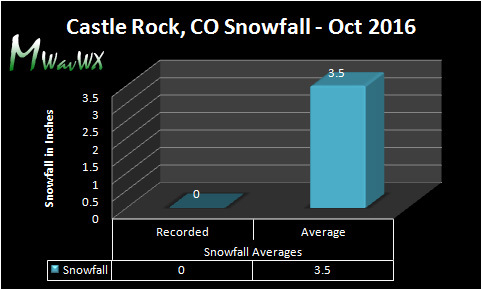 For Castle Rock Colorado the measured precipitation finished 0.97 inches below average. 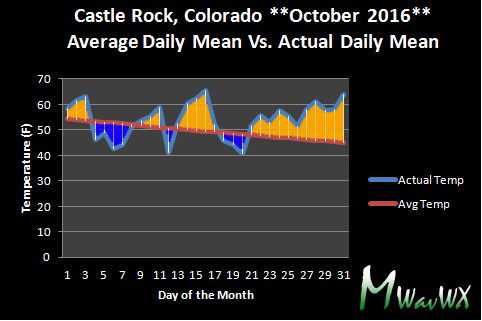 Castle Rock has now seen 4 consecutive months with below to well below average precipitation and has not had a month at average or above average since June 2016. 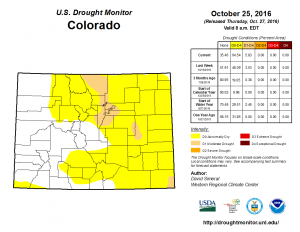 Most of Douglas County including Castle Rock is currently classified as “Moderate Drought.” Some areas to the East and South of Castle Rock remain in an “Abnormally Dry” status. In northeastern Colorado, short-term precipitation deficits during the past 30 days led to expansion of Abnormally Dry (D0). Overall, the region was very dry during the past week with average temperatures ranging from two-to-eight degrees above normal. November 2016 started out right where October left off with very warm and dry temperatures. Most of the first half of the month featured a large ridging pattern across the Western U.S. and kept storm systems with cold air and precipitation mostly away from Colorado. The ski resorts even struggled to open on time this year as the mountains didn’t see a whole lot of snowfall early on. The later part of the month saw a major weather pattern flip and we began to see more intrusions of colder air and storm systems with snowfall. Looking at the daily mean versus average graph we can see the first half of the month continued the extreme warmth from October. 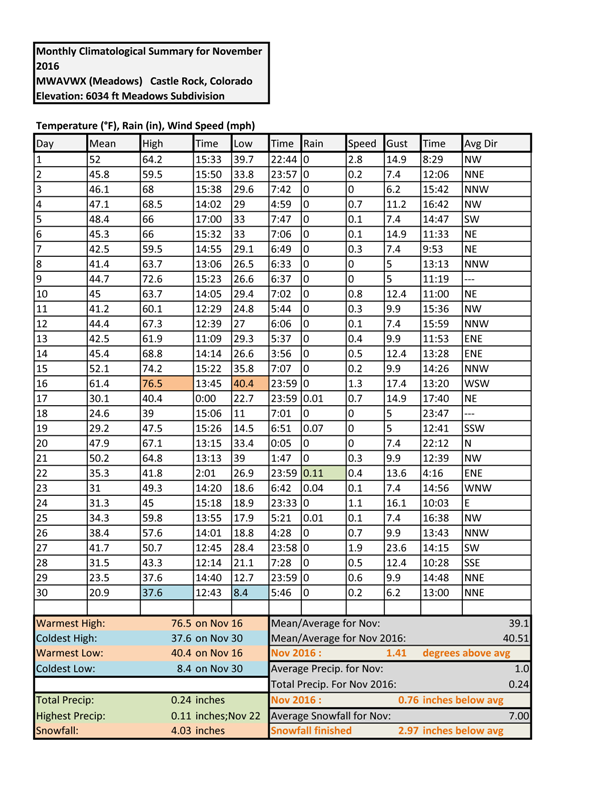 (Take a look at the orange starting about mid October and running through mid November!) By the second half of the month we finally see the first dips of below average temperatures in nearly a month. 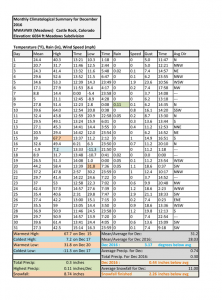 Because of the much higher than average temperatures earlier in the month combined with the higher spikes in warm temperature, November 2016 finished above average overall on temperature. As we move into November we start talking more about snow for precipitation instead of rain, but we can still get rain here and there in the winter months. Mainly we focus on snow as the temperatures are more often than not cold enough and at the end of the day it is moisture that we need. November is not an exceptionally snowy month but we do see a fair amount normally. 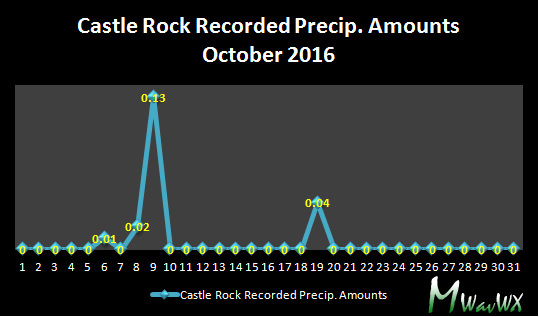 Total liquid precipitation for Castle Rock finished at 0.24 inches which is 0.76 inches below average. 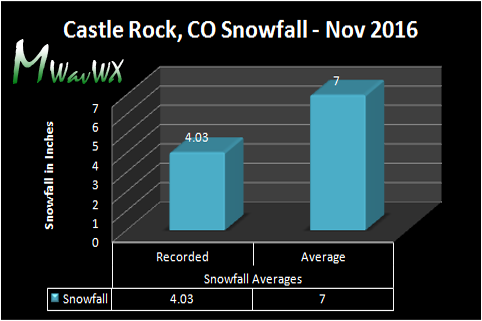 Snowfall for Castle Rock finished at 4.03 inches which is 2.97 inches below average. Castle Rock has now seen 5 consecutive months with below to well below average precipitation and has not had a month at average or above average since June 2016. Two areas we are keeping an eye on as we start the month of December; drought and the possibility of a very cold start to the month. 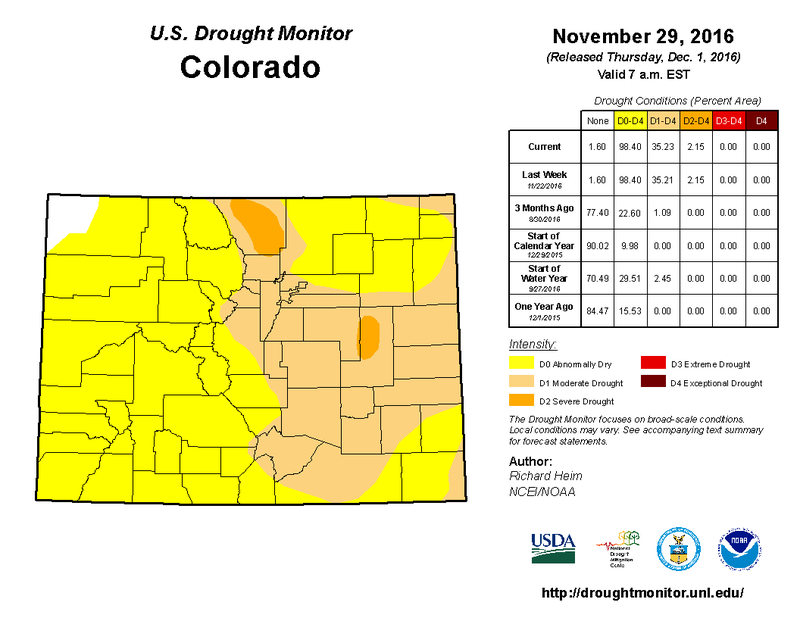 Drought continues to expand in Colorado as most of the state is under some sort of dry classification. There hasn’t been much change along the Palmer Divide as we mostly remain in the “Moderate Drought” classification. 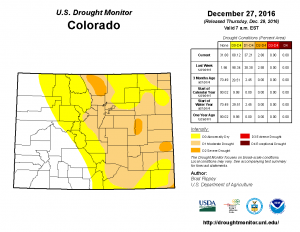 The only exception is the areas on the extreme eastern edge of the Palmer Divide (think Limon area) that are now considered in a “Severe Drought” status along with areas in and West of Fort Collins. This type of drought expansion is not uncommon to a La Nina pattern so we will keep an eye out to see if the drought worsens in the coming weeks. I don’t always like to show the Climate Prediction Center graphics as I don’t always agree with them, but in this case I think they hit the nail on the head as far as the first week or two of December is concerned. The latest CPC temperature anamoly product shows a very high chance of below normal temperatures and given my earlier article and look at the Arctic air pooling in Alaska; I think this is highly likely. I would expect the first half of the month to be chilly but the second half is still a bit uncertain. I would not be surprised to see a cooler than average December 2016. Colorado is often known for its “roller coaster” like weather but December 2016 was crazy! We saw huge dips and jumps with our overall temperatures throughout the month, accentuated by sharp cold fronts and mild windy days helped by downslope winds along the front range. Despite the few warm days we had (some of them were quite mild) the cold snaps were strong and prolonged enough to keep the month of December well below average in terms of temperature. Snowfall was below average for the month but overall it was not as dry as past months. We finished with 8.74 inches of snow which is a couple shy of our average. 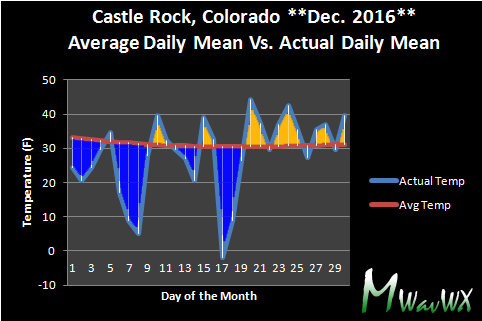 December 2016 ends up as the sixth month in a row we’ve seen below average precipitation for the Castle Rock area and finished up what looks likely to be a dry year overall. Total liquid precipitation for Castle Rock finished at 0.30 inches which is 0.74 inches below average. 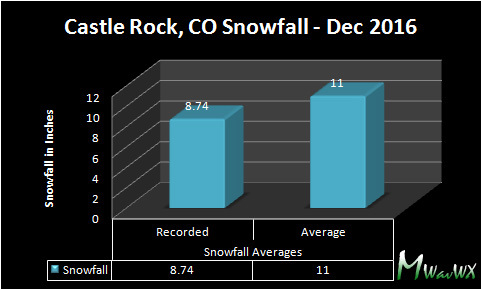 Snowfall for Castle Rock finished at 8.74 inches which is 2.26 inches below average. Castle Rock has now seen 6 consecutive months with below to well below average precipitation and has not had a month at average or above average since June 2016. January 2017 looks to continue a couple of trends we have seen the past few months in terms of our Winter weather pattern. There was little to no change in Colorado’s drought status, the plains of Colorado and some mountain areas remain very dry. Despite the few snow storms we have seen in the month of December, our storm systems have not produced enough moisture to make a dent in our drought conditions. The good news is that the mountains have seen a drastic improvement in their snowpack conditions! This was something I eluded to earlier in the fall. The mountains started out pretty poorly with snow but I surmised that their snowpack conditions would improve drastically at some point as they often tend to do well in La Nina years… even with a slow start in fall. If you look at the average snowpack in all basins across Colorado, most areas are at or slightly above average. This is huge improvement over just a few weeks for Colorado and may bode well for our streams and reservoirs this spring if this trend continues. The CPC monthly outlook doesn’t help a whole lot when looking at what January 2017 may bring as it has equal chances of being above or below average on temperature and precipitation. There are however, a few things we can glean from an outlook like this if it verifies. Notice the higher chances of colder temperatures in the Northwest and the higher than average chances of above average precipitation follows the same area. This means to me that our storm track should stay relatively similar to how it’s been the past few weeks. We should expect storms to continue to move into Colorado from the Northwest. This means outbreaks of cold air with heavier bouts of snow in the mountains but we should remain drier than average for the front range. 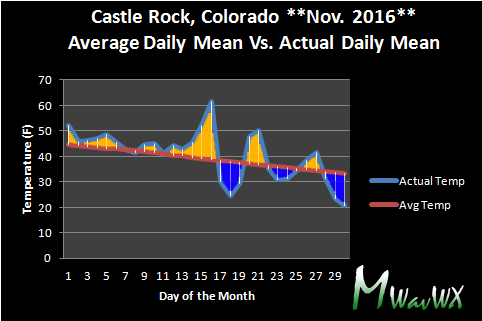 I’d expect the month to finish around average in terms of temperature and below average for precipitation in the Castle Rock area.